1.1 What are the programs offered by CUHK Business School? 1.2 What are the entrance requirements for business programs? 1. The above Elective Subjects refer to Category A subjects in the New Senior Secondary curriculum. 2. Other Language Subjects (Grade E or above) will be considered as unspecified elective subjects (i.e. Elective Subject 2) where applicable. +A minimum TOEFL score of 600 (paper) / 250 (computer) / 100 (internet) or a minimum IELTS score of 7.0 or native speaker documentation. #The programs will accept “Attained with Distinction” in Applied Learning subjects as extra elective subject for awarding bonus points. In addition to public examination results, candidates’ school reference reports, school examination results, extra-curricular achievements and other learning experiences will also be taken into consideration. 1.3 How is the admission score calculated? 1.4 How will bonus points be awarded to extra elective subjects? In addition to subjects considered in the selection principles of programs (that is, Best 5 or 4C+2X), applicants’ performance in extra elective subjects will be considered, and bonus points will be awarded to up to the 7th subject. 1.5 Do students have to take the Extended Modules in Mathematics? For business programs, students are not required to take the Extended Modules in the Mathematics subject. 1.6 Will CUHK consider Applied Learning subjects? Some programs will accept “Attained with Distinction” in Applied Learning subjects as extra elective subjects. Applied Learning subjects will not be considered as the elective subject in the minimum eligibility for application of 4 core and 2 elective subjects. 1.7 Will CUHK consider Other Language subjects? Other Language subjects (with Grade E or above) will be recognized as unspecified elective subjects in meeting the entrance requirements in university admission. 1.8 Does the program know the order of my program choices? CUHK will consider the experiences and achievements in Other Learning Experiences of students submitted using the relevant template in the JUPAS application form. Students may also submit their Student Learning Profile (SLP) through JUPAS for reference. If students are invited for interviews, they may also present their portfolios, as the information may provide topics for discussion during interviews. OEA information submitted by applicants as part of their JUPAS application form will serve as additional reference for admission selection and can also be used as a framework or discussion during selection interviews. 1.9 Does the program know the order of my program choices? 1.10 When will programs arrange interviews for JUPAS applicants? Two rounds of interview would be arranged for JUPAS applicants. One will be arranged before the release of HKDSE results from 3 – 6, and 8 June 2019 while one will be arranged after the release of HKDSE results. Both interviews will only be provided to Band A applicants. 1.11 How will my interview performance affect my chance of admission? The selection interview is an opportunity for the program to better understand the aptitude and aspiration of an applicant. For programs that conduct selection interviews, interview performance is one of the factors taken into consideration in admission decisions when determining applicants’ priority on the merit order list, if any. 1.12 How are candidates selected for interviews? For the admission interview before the release of HKDSE results, it would be arranged from 3 – 6, and 8 June 2019 after the reprioritization of JUPAS choice in May 2019. Only those applicants who put CUHK Business School programs in Band A would be invited to join the interview. For the admission interview after the release of HKDSE results, individual program will invite the shortlisted BAND A candidates to attend the interview. Admission decisions will be made after the announcement of HKDSE results and will be announced through JUPAS in mid of August. 1.13 Shall I be given a conditional offer after the interview? No. As a gentlemen rule, all universities will not grant conditional offers to applicants after the interview, with the exception of those under School Principal’s Nomination, Other Experiences and Achievements, and Sports Scholarship Scheme. 1.14 Am I still considered if I am not granted an interview? Yes, applicants will still be considered by the University for admission even if they are not invited to attend an interview. Their public examination results, non-academic experience / achievements and other factors than deem appropriate will be taken into consideration. 2.1 Can I apply for admission to the University through both JUPAS and Non-JUPAS (Local) Admission Scheme at the same time? No. Applicants can apply through either one of the two schemes according to their academic qualifications in the same academic year but NOT both. 2.2 Can students apply for admission through Non-JUPAS on the strength of their IB exam results? Applicants with qualifications other than HKDSE results (for example, IB, GCE/INT A-Level, GSAT, OSSD, and Sub-degree, etc.) should apply through Non-JUPAS Admission Scheme for admission. 2.3 Will students with recognized HKALE equivalent or above qualifications (for example, IB, GCE/INT A-Level and Sub-degree) be admitted on Advanced Standing status? Students who meet specific requirements as stipulated by the University for particular qualifications (including GCE-AL, International-AL, IB, Cambridge Pre-U, HKALE, associate degree/higher diploma) may apply for “Admission with Advanced Standing”. The minimum number of units for graduation for students admitted with Advanced Standing may be reduced by up to 24 (normative period of study may be reduced by up to one year). 2.4 I note that there are Non-JUPAS (Local) and International admission channels to apply to the business programs. Which channel should I apply? If you require a student visa to study in Hong Kong, you can apply for full-time undergraduate studies at CUHK through "International Students Admission Scheme". Those who have the right of abode in Hong Kong or the right to land in Hong Kong (i.e. those who do not require a student visa to study in Hong Kong) should apply via the "Non-JUPAS (Local) Scheme". 2.5 Are there any minimum admission requirements for Non-JUPAS applicants? For candidates who have completed only GCE-AS or the first year of IB Diploma studies with outstanding results, they may be considered for admission under special circumstances on individual merits case-by-case. 2.6 Can I apply for credit transfer? Applicants who have successfully completed courses at undergraduate level before admissions to the University may apply for course and unit exemption after they have registered as a student of the University. Such applications will be considered case by case, based on individual merits. 2.7 Can I apply for admission if my examination results have not yet been released before the application deadline? You can still apply for admission to the University. You should submit the application form first before the deadline, and send the examination results to the University once available. 2.8 I am a current Gao Kao candidate from mainland China and would like to enroll in the business program. How should I apply? 2.9 I am a student studying at an international high school in Mainland China. Are there any channels other than the National Colleges and Universities Enrolment System「全国普通高校统一招生计划」to apply to the business program? You may apply via the International Students Admission Channel. 3.1 What is the curriculum structure for the 4-year curriculum? 3.2 What is Faculty Package? Faculty Package allows students to take courses normally worth up to 9 credit units outside their Major but within the Faculty, thus broadening their knowledge beyond their chosen fields of specialization. Credit units thus earned will count towards their Major Requirements. 3.3 Can I take double major, minors, and double degrees? Students are given flexibility to take double majors, minors and double degrees, as long as it is within the purview of the University’s regulations. A coherent collection of 18 to 30 units in a discipline can constitute a Minor, and students can take up to two Minors according to their interest. 3.4 What are the University Core Courses? The University Core Courses consist of Chinese Language, English Language, General Education, Information Technology and Physical Education. 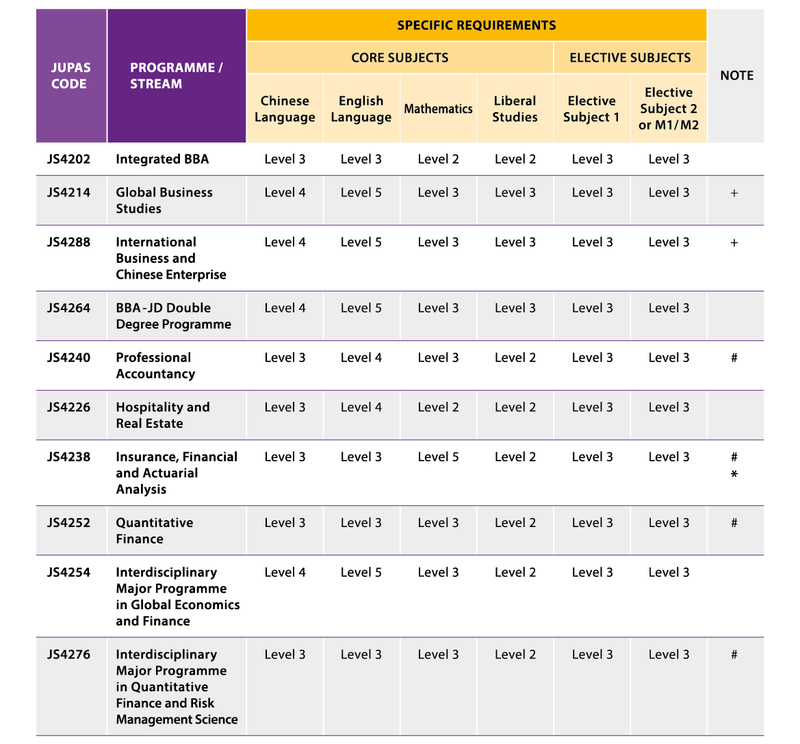 4.1 What Experiential Learning Activities are available at CUHK Business School? Complimenting the formal curriculum, these activities help students to broaden their horizons and achieve an all-round development. 4.2 What will the student’s first year experience be? The first year experience at CUHK takes an integrated approach to student learning and development through curriculum design, student support programs and extra-curricular activities. The University Core and Faculty Packages, much of which is taken in the first year, are designed to facilitate student transition by developing the knowledge, skills and attitudes essential to independent learning. Meaningful relationships with teachers and fellow students from different academic disciplines can be established through small group interaction in some of these courses. Beyond the classroom education, orientation activities are offered before students commence their studies. Student support services and programs, both academic and social, are tailored to the needs of first year students. Various extra-curricular activities organized by CUHK Business School, the Office of Student Affairs and the Colleges also encourage first year students' participation, widening their exposure and enriching their learning. 4.3 What is the "College System"? Of all universities in Hong Kong, CUHK is the only one that offers a college experience. Each undergraduate is assigned to one of the constituent Colleges, Chung Chi, New Asia, United, Shaw, Morningside, S.H. Ho, CW Chu, Wu Yee Sun and Lee Woo Sing. The Colleges complement the formal curricula to deliver whole-person education and pastoral care. The college system encourages interaction among teachers, students and alumni. 4.4 How are students assigned to Colleges? Applicants who have been admitted to a full-time undergraduate program will be asked to indicate their preferences for college affiliation. In assigning new students to different Colleges, it is desirable that each College would have students from different faculties or departments to facilitate interdisciplinary exchange of knowledge and ideas and to widen the students' intellectual perspective. The system for assigning new students to Colleges takes into consideration the preferences of students, their study programs and admission scores. Priority is given to a new student to be assigned to his/her first-preference College if either of his/her parents is an alumnus of the College. 4.5 Can students apply for hostel accommodation?